Another year has passed and we ask ourselves-Was it a year well spent? Did we try to succeed in our endeavors to the best of our capabilities or were we so lackadaisical in everything that we let another year go by wallowing in mediocrity? Most of the time we perform our daily chores in robotic fashion. The passion has left our soul and each new day was as blah as yesterday. Well, it is time to look forward to a New Year, to a new you. Let us reinvent ourselves this year and look for something that will tickle our fancy, that will put back the fire in our existence. Whether it is learning a new sport or a new dance exercise, going to a new gym, having a new business endeavor, a new charity, going back to school, or whatever! Just do it! Don't let another year go by and regret that you did not do something to stoke the fires of your passion and did not reinvent yourself. December was a month of social functions. A lot of friends celebrated their birthdays, anniversaries, weddings of their children, offices had their Christmas parties, books were launched, resorts and boutique hotels had their soft openings. 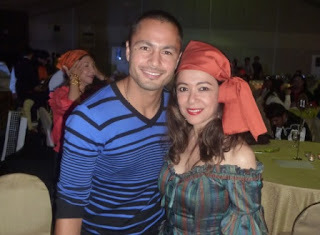 Dec. 20 was the Philippine Star Christmas Party. The theme was Pirates of the Caribbean. Isaac Belmonte won the best costume! Wow, he could have put Johnny Depp out of business. He looked like a real authentic Pirate, what with his long hair, a pirate's saber, enough jewelry from a Pirate's treasure chest, chunky shoes and all. The highlight of the event was the speech of Phil Star President Miguel Belmonte who thanked the Phil Star family for the productive work they did in 2011. He did not forget to thank the good Lord for all His blessings. He made all the employees and columnists present there very happy with the unexpected bounty they all received. The presence of movie stars Jericho Rosales and Derek Ramsey thrilled us ladies as they were very accommodating in posing with all of us. We are movie fans at heart. Heart throb Derek Ramsey graciously posed with all the ladies. Dec 27 was a small intimate gathering of friends at David Lim's architecturally impressive house. Rupert and Tina Jacinto are really happy this season as their two daughters Jackie and Liezl came from New York and Tokyo respectively to spend the holidays with them. Two adorable grandchildren, Arisa and Keiji complete the happy household. The party was made meaningful by the gathering of the guests around the piano singing Christmas Carols. David made sure he printed enough lyrics for everyone. The Jacinto daughters Jackie and Liezl surprised parents Rupert and Tina Jacinto by coming for the holidays. Liezl's son Keiji and daughter Arisa complete the pack. 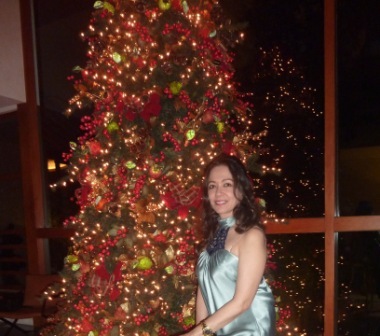 David Lim's Christmas tree is so gorgeous that I just had to strike a pose! Dec.28 was my out of town sortie with close buddies Cecile Infantado and Grace Glory Go. We were generously hosted by Hamilo Cove, thanks to the invitation of PR company EON. Amiel Mendoza of EON was our perfect guide and Annika Punzalan, Hamilo's tres charmant PR Lady made sure our stay was as comfortable as possible. Hamilo is located in Nasugbu, Batangas, barely 3 hrs away from Manila, yet a world completely unto itself with its breathtaking beauty and unique coves. It will rise as a network of leisure communities that enable a live-work- heal-play lifestyle- with breath taking settings ranging from popular waterfront locales to secluded ultra -exclusive coves. We were completely relaxed the two days that we spent there, and Annika was our perfect hostess. She made sure that we availed of their soothing massage as well as savor their evening buffets of different cuisines (the first night was Mediterranean and 2nd evening was Mexican). We also enjoyed dancing to the music of the two different bands. We shall return to Hamilo Cove, we promised Annika. The Brazilian Models arrived for the Mardi Gras party on the 30th of Dec.
Dec. 30 was the beauteous Linda Ley's birthday celebration at the Salon de Ning. In lieu of gifts, she requested as to donate to her favorite charity. Let's drink to that and to our celebrant, who is a beautiful lady inside out. Lovey dovey couple Romy Rodriguez and wife Ruth Hahn R.
Choosing Miss Cebu was a Fun Experience!